That you sign a donor card like the one below and carry it with you at all times. That you let your family know of your wishes. Signed consent from next-of-kin is required at the time of death. This is most important as it is of great help for families to know their loved one’s wishes in advance. 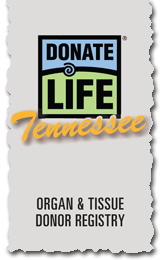 We invite you to join the thousands of fellow Tennesseans who have decided to become donors. Donation is a decision for life and is the most important decision you will ever make for the benefit of others.